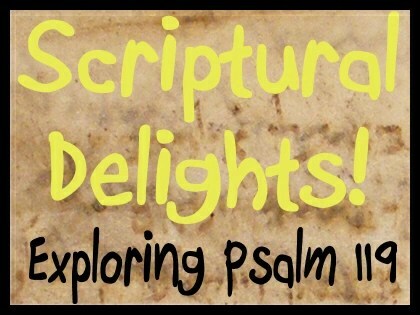 G’day and welcome to Partake and our series “Scriptural Delights!” Here is our thirteenth podcast of our series going through the wonder that is Psalm 119! Today we look at the eleventh of its twenty-two letters, Kaph and its verses 81 to 88. Thank you for reading, Sandy! Well we are half way there! I hope you are enjoying going through the wonder that this Psalm 119 as the Psalmist meanders his way talking about his love of God, love of God’s Word and about his own life in God and in relation to other people. Here the Psalmist is fading. He is languishing in desperation, worn out and expiring. You can feel his weakness as he pitifully cries out that he is wilting under pressure and his eyes are failing due to darkness overpowering him. You can sense the life draining out of him as he pitifully cries out to God. But yet… Yet the Psalmist, despite being in such desperate condition, continues to have a twin hope. A yearning for salvation brings about a hope in God’s word. The Psalmist knows that salvation will come to him, because God has promised it and God always keeps His promises. David knows God will rescue him because God never disappoints! When desire is exhausted and extinguished, then a certain and sure hope takes over to lift the Psalmist back up again. With weakened eyes the Psalmist seeks comfort and ease. The picture of wineskins being smoked is perhaps strange to us in the 21st century world. But for David they were an explicit illustration of his condition. Wineskins when empty were hung up in the tent and when smoke filled the tent as it often did, the wineskins grew haggard, wrinkled from the heat and blackened with soot. It’s a picture of David’s face. He is no longer the ruddy-faced shepherd of his youth. He feels decrepit, wrinkled, haggard and gloomy. His body was feeling listless and dilapidated. He had endured persecution, undergone the torment of slanderous lies being told about him and his character blackened as if with soot. And yet… and yet he still had hope, a glimmer of anticipation – he does not forget God’s decrees and statutes. This is his way of reaching out to hold God’s hand through this time. He is waiting for his God to deliver & rescue him, to realise the hope he had placed in Jehovah God. David was getting edgy and fed up! He has placed his grievances against others into the court of the Lord and was waiting for justice to be done! He wants his persecutors punished according to God’s law! His persecutors were digging him many pits to which to trap and bury him. They were contravening God’s law with jesting, arrogance and a haughty step. But David’s enemies had forgotten that while they were his enemies, they were also enemies of God! God who had decreed and given commandments to be followed! David had followed God’s commands so would be rescued from his tormentors. David had not forgotten about God and what God had promised him. God will help him and David is stretching out his hands for help. And isn’t this last verse more than delightful. It is not only the Psalmist saying spare or preserve my life. We get a sense it is more a case of “Give me life!” The Psalmist is not seeking merely survival but wanting a full life restored to him. And he knows that this God he follows and serves will grant him new life! David will live again! God has promised it! WOW! Despite what he is going through, David knows he will have new life! This new life will see David continue to exhibit a life worthy of God as he follows God’s commands in a dynamic relationship. What God has said, David will do. David was assuredly a man after God’s own heart. How are you doing right now? Are you feeling as David was? Confused, aged, drying up, wrinkled and lacking energy – physically and/or spiritually? Are people mocking you and jeering you because of the faith you have in Jesus Christ? Take heart for God is watching, protecting and will rescue you. Stay faithful to Him despite all the opposition you are enduring and the Great God whom you seek to serve will come to your aid. Don’t give into the doubters by compromising yourself but hold true to God and His word. If you are the subject of abuse, injustice or any kind of wrongdoing, take your case to God in prayer! Let the God of justice help you, give you counsel through the Bible and minister to you. Ask the Holy Spirit to give you comfort, for that is one of his names – the Comforter. Whatever you are going through reach out and touch God’s hand that is outstretched to you. Reach out in gratitude to the great God and as an act of gratitude, seek to serve a holy life worthy of being called His servant. Thank you. at the last turn-Zion! God in full view! O God of Jacob, open your ears-I’m praying! O priests-descendants of Aaron-praise the Lord!